You are viewing a beautiful solid surgical steel belly button ring that features a large round bezel set sparkling clear cubic zirconia diamante. The round pendant is a chunky 10mm long by 12mm bezel set and is also made from SOLID surgical steel - NO PLATING. 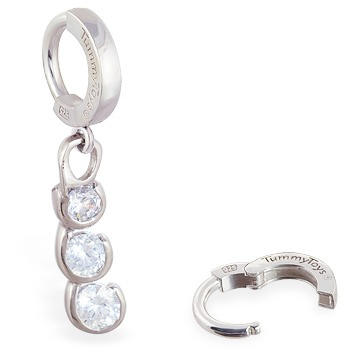 The full length of the body jewellery including the clasp is 27mm. You are viewing a beautiful solid surgical steel belly button ring that features a lovely free form charm and a CZ set in the middle. The free form pendant is also made from SOLID surgical steel - NO PLATING. You are viewing a beautiful solid surgical steel belly button ring that features a double heart twisted around a sparkling clear cubic zirconia diamante. 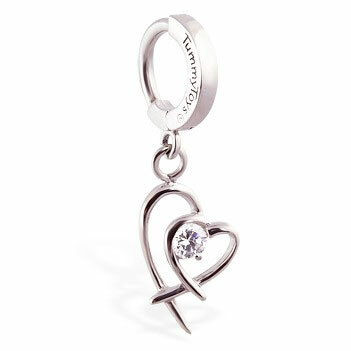 The heart pendant is 17mm long by 11mm wide and is also made from SOLID surgical steel - NO PLATING. This stunning navel ring would make a sensational peice for the bride or as a special gift for your girlfriend. 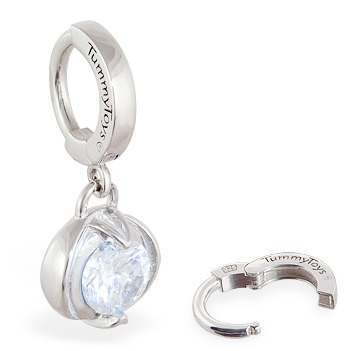 A stunning symbol of love that dangles freely over the navel. You are viewing a beautiful solid surgical steel belly button ring that features an interlocking double heart charm. The heart pendant is 21mm long by 12mm wide and is also made from SOLID surgical steel - NO PLATING. 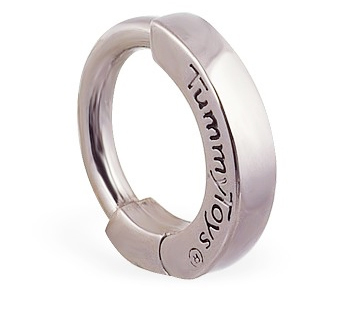 Total length of full body jewellery including the clasp is 35mm. This stunning navel ring would make a sensational piece for the bride or as a special gift for your girlfriend. 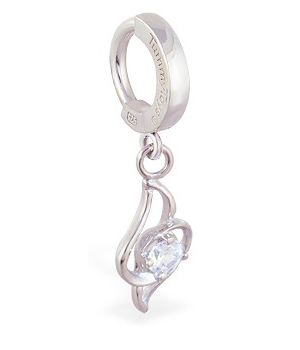 A stunning symbol of love that dangles freely over the navel. You are viewing a beautiful solid surgical steel belly button ring that features a chunky surgical steel heart charm, paved with pink cubic zirconia gems. The heart pendant is 14mm wide. Both the clasp and pendants are SOLID surgical steel - NO PLATING. You are viewing an authentic solid 316L surgical steel belly huggy with a dazzling steel cubic zirconia disco ball. 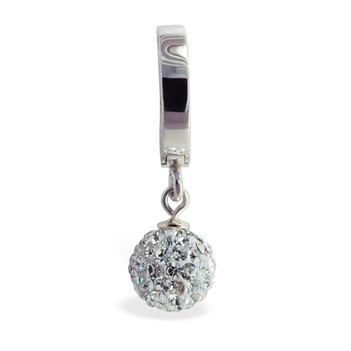 This belly ring is stunning, the dangling solid disco ball features sparkly white cubic zirconia diamonds. A classic and timeless piece. If you're looking for a belly ring of quality, class & style this is the one! You are viewing a beautiful solid surgical steel belly button ring that features a sparkling drop of cubic zirconia gems encased in an intentionally unfinished bezel set. This unique design navel jewellery is a stunner.